Notes from the Slushpile: Publisher Kate Wilson: As The Nosy Crow Flies! 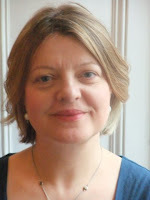 Kate Wilson, founder and MD of Nosy Crow, landed at the Lincoln Book Festival on Saturday 14th May. Refusing all offers of food and rest, Kate flew up the stairs and perched on her seat to talk about what Nosy Crow was all about. Enough with the bird analogies and down to the Nosy Crow business and Kate's passion for children's stories. A Scot with a peculiar accent and a mean side (she said it, not me, and she meant careful with money rather than vindictive), Kate started her publishing career in rights with Faber and Faber which was a good thing as she began to learn if a book worked by showing it to experienced editors buying translation rights at book fiars. The first stirrings of the fledgling publisher came when Kate observed potential buyers turning a page and then turning back before going on. Okay if this happens once, she says, but when it happens time after time, you know that maybe something's not quite working with the way the story is working. She moved on to publishing and business roles as MD of Macmillan and Scholastic and decided after 23 years of publishing books for other people that she’d like to publish some of her own. This drive to create and get children reading for pleasure through story making is the wind beneath the wings of Nosy Crow (sorry). These ideals are backed by some sharp analysis of what does and does not work in children's publishing and how she could make Nosy Crow the publisher that flies. Kate works with a small team in a smallish office but within polite cake-eating distance of one another. Nosy Crow produces children's fiction (including board books, novelty books and picture books) for 0 – 12, and highly-interactive apps for children from 2 – 7. They’ll publish 23 print books books this year and 5 apps. The first baby out of the nest was Small Blue Thing, a supernatural romance for 11 plus with NO VAMPIRES. 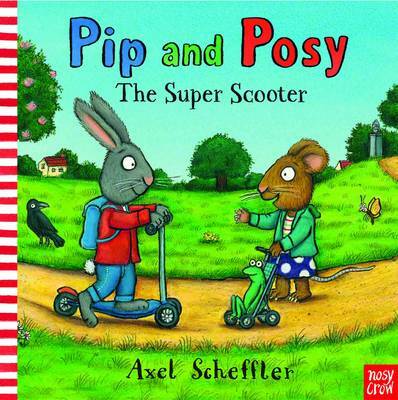 Amongst her impressive aviary of authors is Philip Ardagh with The Grunts and Axel Scheffler's Pip and Posy books. Some work is produced in house, board books like the Noodle series of touch-and-feel board books with furry ears and sparkly bits. The apps are likewise produced in house but the ideas and story lines could well come from a writer well-versed in this product. Nosy Crow’s first app, The Three Little Pigs, has been published to wide acclaim. So what's Nosy Crow about? THE BIG QUESTION is always 'who's it for?' Nosy Crow doesn’t publish a book or an app unless they have a clear sense of the core readership. Kate's not thinking London, literature and reviews, she's thinking Wigan, literacy and real children. Selecting the good from the bad using a set of consistent standards and values so that the Nosy Crow brand has real meaning. Kate also stressed the publisher’s role in protecting authors’ and illustrators’ rights in a digital environment in which piracy is rife. Kate thinks that the internet brings to publishers – and to authors – an opportunity to engage with readers in a way that’s never been possible before. Instead of publisher PR being about SHOUTING at an unseen audience, social media provides a way to engage audiences in a two way conversation, and Nosy Crow is active on its website, on Twitter and on Facebook. It's an exciting map of interconnecting participants in the publishing process – the author, the publisher, the bookseller, the critic (everyone's a critic now) – all connecting with one another online. Nosy Crow will go where other publishers fear to tread! Kate wants her company to be an informed voice in children’s books and will talk about books published by other publishers too. A recent Easter and Spring booklist contained just two Nosy Crow books amongst the many others suggested by Kate and her Twitter followers. Kate (right) poses with groupie and leading stalker. Speaking at the SCBWI event. In the world of social media, communication is personal, and Kate believes that being a small, personal company is an advantage in this environment; so she's just as likely to tweet about checking her kids’ hair for headlice as well as her excitement about her latest book. Kate Wilson's t-shirt says it all! For novels and texts, really good writing is key, and if Kate and if the team see the potential in a submission they will sometimes work with the writer to refine the story. Similarly, if Kate and the team see the potential in even a single character sketch from an illustrator, they’ll work with that illustrator to develop a project. Nosy Crow has already spread its wings and collaborates with international partners: Allen and Unwin in Australia, Candlewick Press in the US, Carlsen in Germany and Gallimard Jeunesse in France. So What is Nosy Crow Looking For? ALWAYS REMEMBER – Who's it for? Nosy Crow will want to know! Nosy Crow's acclaimed Three Little Pigs app. If you can't see the video, you can view it on YouTube. Kate has given up the slower flapping wings of big traditional publishing for the zippy repsonsiveness of the smaller bird. She's in touch, creative and passionate about story. Kate wants Nosy Crow to be different and to make a difference. I'm sure it will. Thanks for this Addy - really good stuff! Thanks for this, Addy-stalker. Can't wait to see her at the Professional Series in September. Real shame I couldn't make it to this one. It looks great. This all sounds so exciting! Just love the new opportunities and growth in children's publishing at the moment. The app looks brilliant - cross between a cartoon and a computer game. 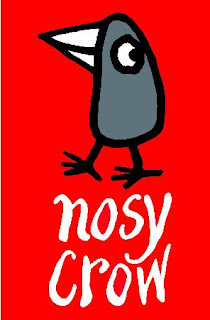 Something new about Nosy Crow that's very exciting - I like it!!! Kate was an exciting person. I wanted to leap at her with mss and apps but she didn't like that at all - far better to follow submission guidelines. Thanks for sharing news from the event. I love Nosy Crow's ethos, but my current WIP is way too edgy for their list. I'm a great fan of Nosy Crow already. Really looking forward to the wonderfulness they create. And I love your analogy of the zippy responsiveness of the smaller bird. It's just what the market needs. Great profile - thanks! I'll be thinking of them for future w-i-p! Must say I love the 3 little pigs app. I couldn't resist getting it to check it out. Great post, Addy - thank you. It's so exciting to see really new and dynamic approaches to children's publishing, and as a fledgling Nosy Crow author (sorry the bird metaphors are so hard to resist) I can confirm that they are lovely to work with, too.